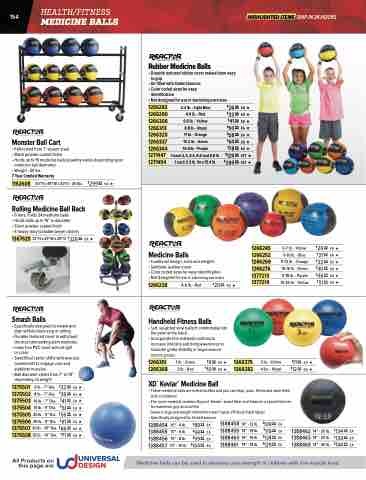 medicine ball diameter) • Weight - 30 lbs. 1162608 30”H x 49”W x 20”D - 30 lbs. 1375505 20lb.-9”Dia. $5699 EA H 1375506 25 lb. - 9” Dia. $61 99 EA H 1375507 30lb.-10”Dia. $6699 EA H 1375508 35 lb. - 10” Dia. Medicine balls can be used to develop core strength in children with low muscle tone. 1 each 2.2, 4.4, 6.6 and 8.8 lb. 1each2.2lb.thru15.4lb.